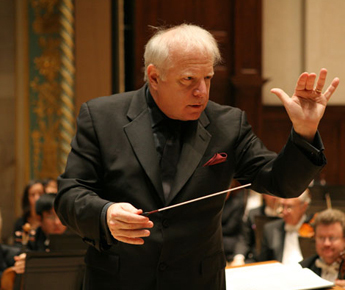 Leonard Slatkin celebrates his 70th birthday on Friday, August 8, leading the BSO in a program featuring the world premiere of composer William Bolcom’s Circus Overture, which was commissioned by the BSO to honor Maestro Slatkin. Gil Shaham joins Mr. Slatkin and the Orchestra for Barber’s Violin Concerto, and the concert concludes with Elgar’s Enigma Variations. Then Stephane Deneve leads the BSO in a program with music by Tchaikovsky and two works from the 20th century. First, Mr. Deneve leads the orchestra in Debussy’s Prelude to The Afternoon of a Faun, followed by Szymanowski’s Violin Concerto No. 2 with violinist Leonidas Kavakos; Tchaikovsky’s Symphony No. 4 bring the concert to a close. On Sunday, August 10, Yo-Yo Ma is featured in an all-Tchaikovsky program with the Boston Symphony Orchestra conducted by David Zinman. Mr. Ma is featured in the Andante cantabile and the Variations on a Rococo Theme, both for cello and orchestra. The program also includes the Polonaise from Tchaikovsky’s operatic masterpiece Eugene Onegin, and the perennial favorite Symphony No. 6, Pathétique. Pianist Jeremy Denk gives an Ozawa Hall recital Wednesday, August 13, for a program of Ives’s Sonata No. 2, Concord, and Bach’s Goldberg Variations. The Philharmonia Baroque Orchestra comes to Ozawa Hall on Thursday, August 14, for a performance of Handel’s 1713 opera seria Teseo, led by early music specialist Nicholas McGegan. The cast includes sopranos Amanda Forsythe, Amy Freston, Dominique Labelle, and Céline Ricci; countertenors Robin Blaze and Drew Minter; and baritone Jeffrey Fields.